A New Map of the Circle of Lower Saxony, from the Latest Authorities. 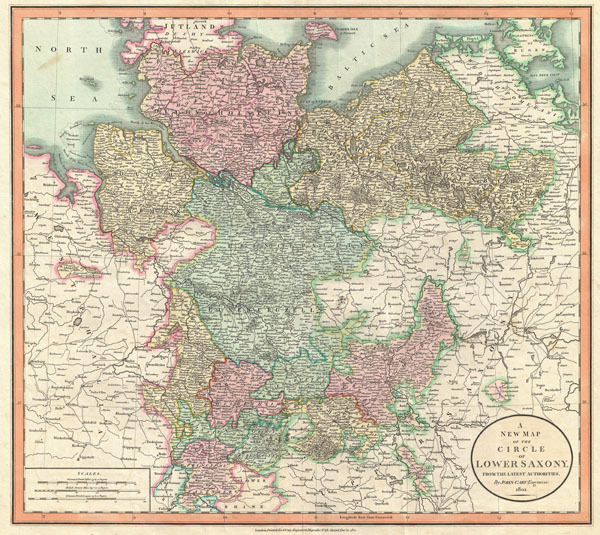 An extremely attractive example of John Cary's 1801 map of the Lower Saxony region of Germany. Consists of the Duchies of Bremen, Holstein, Mecklenburg and Saxe Lauenburg, as well as the Principalities of Leunenburgzell, Calenberg, Wolfenbuttel, Magdeburg, Halberstadt, Grubenhagen and Calenberg, with the Bishopric of Hildensheim. Highly detailed with color coding according to region. Shows forests, cities, palaces, forts, roads, rivers, and offshore sandbars. All in all, one of the most interesting and attractive atlas maps of Lower Saxony to appear in first years of the 19th century. Prepared in 1801 by John Cary for issue in his magnificent 1808 New Universal Atlas. Rumsey 1657.025. Phillips (Atlases) 714. The Map Collector, issue 43, p. 40-47 (Atlas). National Maritime Museum, v. 3, no. 311.